I had also been thinking about the bland taste of the white chocolate spaghetti. Adding all that water just diluted the taste of the chocolate (which doesn’t have a strong taste to begin with) — so what would happen if we’d make spaghetti from something that’s a liquid itself? Then we wouldn’t have to add water as a ‘carrier’ for the agar-agar, and we wouldn’t be diluting the taste. 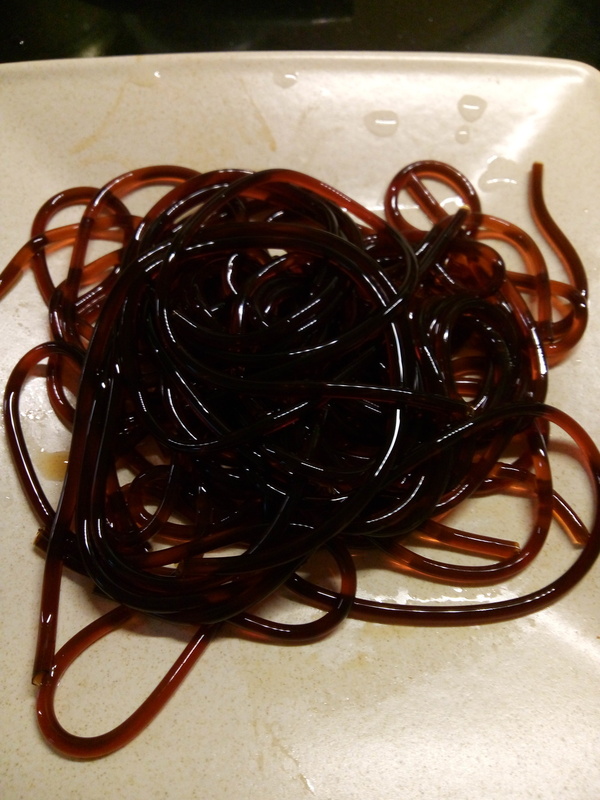 Hence: coffee spaghetti. I made a cup of really, really strong coffee, we added some sugar and a packet of agar-agar powder. With our tripled capacity, it took only three “runs” to use all of the liquid for spaghetti. And with the second syringe we could work in parallel: one of us would pump air through the tubes to get the strands out of the tube, the other could then immediately fill that tube up again. 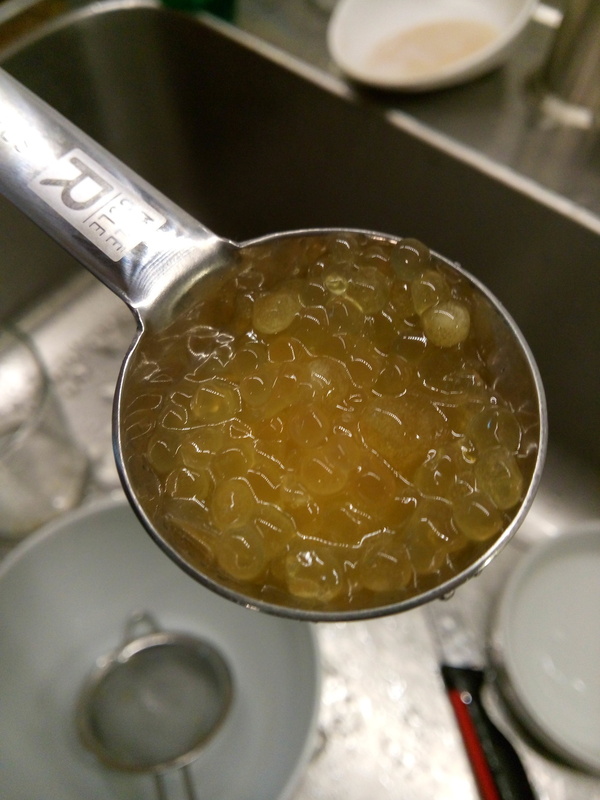 We also wanted to experiment with spherification. 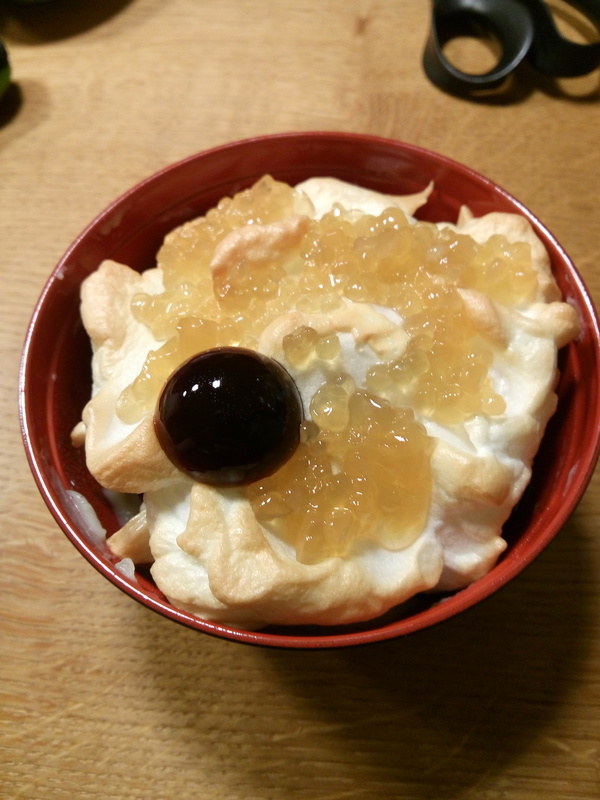 We had bought honey to make honey caviar. 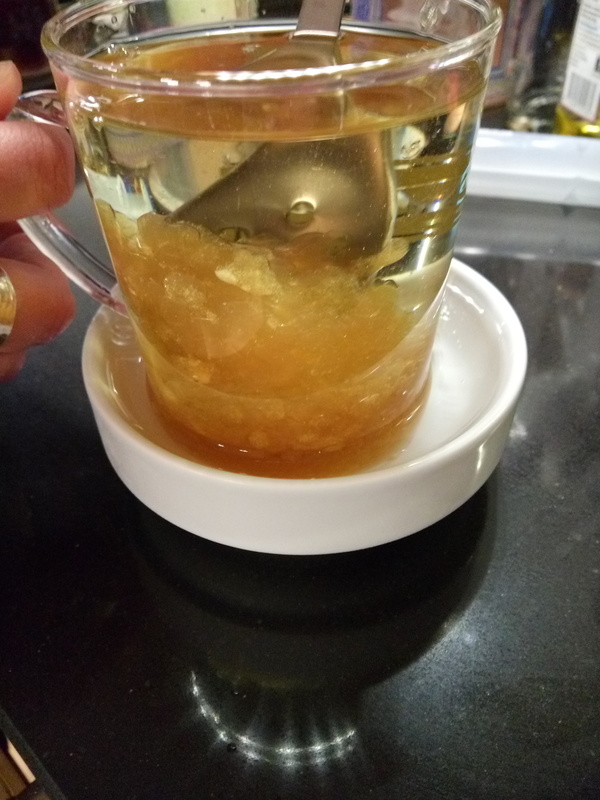 This is our honey-with-agar-agar at the bottom of a cup of cold vegetable oil. Next time, we need to let the liquid cool down before dripping it into the oil. The spheres were still so warm that they got stuck together. Not everything, but it was noticable. Spoon of honey caviar! We had to add some water to the honey, but it still had that delicious honey taste with no discernable dilution. So we thought of a way to build up a dessert of four layers. 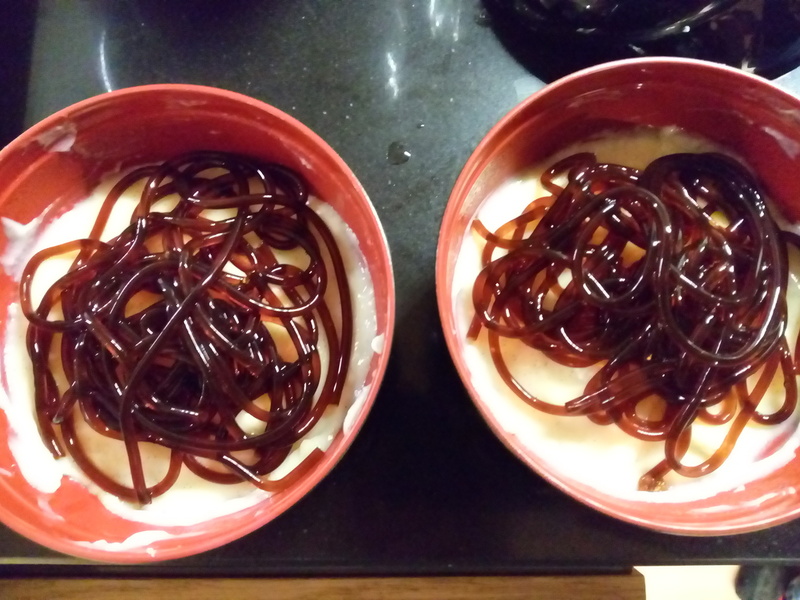 This is the bottom layer: vanilla custard. The bitter coffee spaghetti on top of that. On top of that, baked whipped egg whites (that we had left from making the custard) with a little sugar. Honey caviar on top of that. The uneven surface of the baked eggwhites makes little ‘nooks’ that the caviar can collect in. A cross-section of all the different flavours and textures. 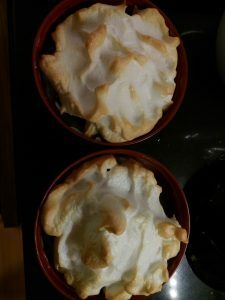 Next time, we’ll make the baked eggwhites proper merengues, so that they are crunchy instead of the marshmallow-like consistency they had, to add a more pronounced texture to the mix. 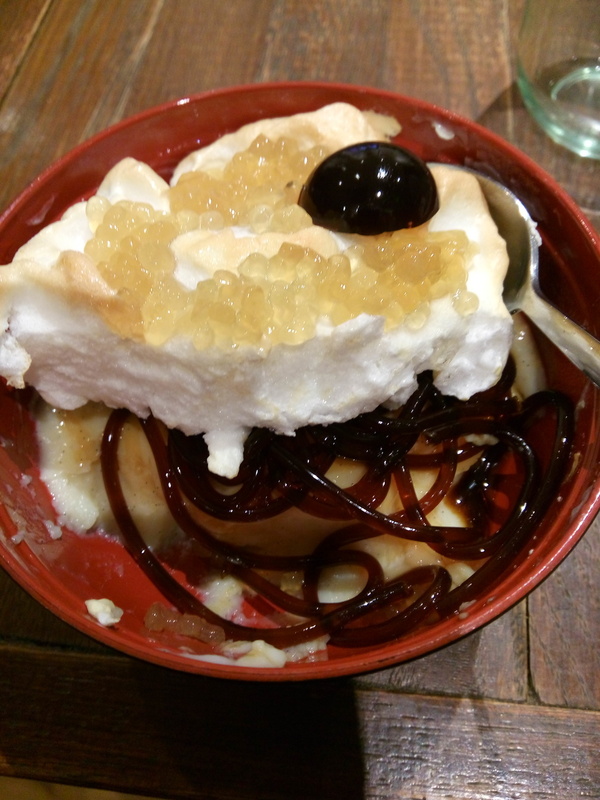 Interesting experiments, and I can see us using this as a ‘grand dessert’ in the future. That's really amazing and sounds so good! Can the tubes be re-used for future portions? I've never heard of molecular cooking kits. Yes. After three minutes, the strands have solidified because the mixture has cooled off. 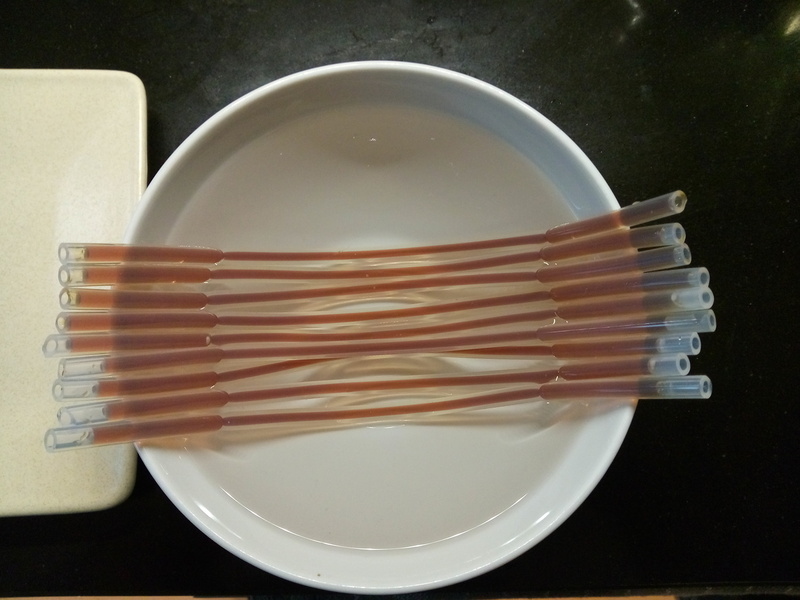 Then you use an empty syringe, filled with air, to blow air into the tube, and the strand will slip out of the tube. Then you can fill the tube again with warm mixture! i admire your food chemistry skills. In highschool, I had a chemistry teacher who always said that chemistry is nothing more than glorified cooking skills. And it seems like the reverse is true as well! your chemistry teacher sounds smart. My goodness, this looks good! It was good to eat as well! 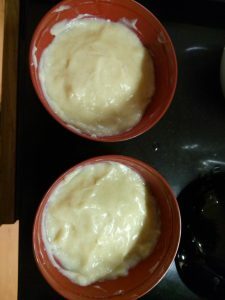 But it was a lot... We could have easily fed four people with the amount of custard we made. Not that we did: of course we all ate it ourselves. Is it something you can refrigerate and then eat the leftovers later? This is so interesting and different! It sounds like it really worked out for you to have more than one kit, and to experiment with liquid flavors to get a stronger result. Lots of possibilities to play around with! Yes, if a single portion takes an hour to make, during which you have to be at the kitchen counter every three minutes, then that takes the fun out of it for sure. But if you can do it three times as fast, then it's a different story. And yes, we can use any liquid, so there's plenty to tinker with! Wow, you make amazing things with this kit. Mind blowing food! And we haven't even tried creating foams yet!